Flynn's Tree Service, located in Middletown, NJ takes great pride in providing our customers with high quality, prompt and reliable service. Owner-operator, Mike Flynn is an ISA Certified Arborist and a New Jersey, state licensed crane operator. We are a fully insured, family operated, all-American tree company and our objective is to maintain your tree health while protecting your property. The professionals at Flynn's Tree Service are experts in hazardous tree evaluation, with over 40 years of experience and education. We take the time to listen to your tree concerns while evaluating your property to formulate the best plan to insure that potential hazards are safely removed. When a storm or extreme weather occurs, Flynn's provides 24-hour emergency service to clear away damage or dangerous situations on your property as soon as possible. Middletown NJ - Flynn's services a wide range of customers in Middletown, NJ, including the Township schools, Middletown Parks, Public Works, and countless satisfied residential customers. 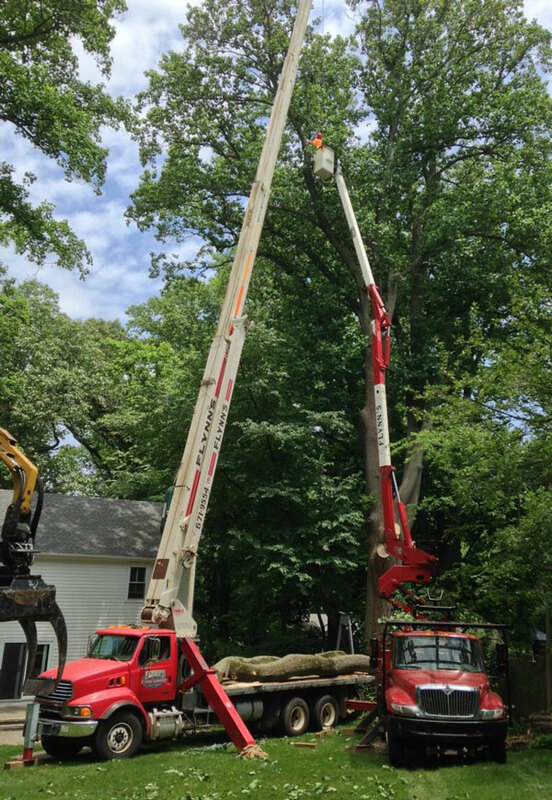 Atlantic Highlands & Highlands NJ - Flynn's Tree Service has worked for the the Borough Atlantic Highlands on numerous occasions. We also performed emergency tree removals and storm clean up for the Borough of Highlands and its residents before, during and after Hurricane Sandy. Red Bank, Fair Haven, Rumson, NJ - Flynn's Tree Service has hundreds of satisfied customers throughout Red Bank, Fair Haven and Rumson, NJ. Flynn’s Tree Service is committed to providing outstanding professional tree care and complete customer satisfaction! Proper tree pruning improves the health of your trees. Well-maintained trees provide environmental and aesthetic benefits for you, your property and the surrounding community. Trees moderate the climate and improve air quality, while enriching the value of your property. Let our experts do what's best for your trees. Certified Crane Operator, Certified Arborist, member TCIA, ISA.